Feeling like you're moving fast is the greatest appeal of most console racing games, with the realism of the scenery you zip past coming in far behind. The Dreamcast/SegaNet versions of Speed Devils Online Racing and POD: Speedzone both claim to cater to this need for an intense experience -- however, they don't deliver an equal rush. Speed Devils Online Racing looks like it's moving fast, but somehow it doesn't feel that way. Maybe the frame rate is bogged down by all the goodies that Speed Devils packs in; the best thing about the game is the inventive design of its race courses. The standouts pit players against raging tornadoes in the Louisiana bayou and rampaging dinosaurs in Hollywood. 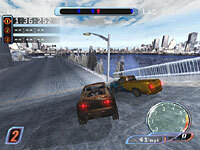 Such obstacles tend to be nothing more than visual gimmicks in most racing games, but in Speed Devils they are well executed and enhance the challenge. 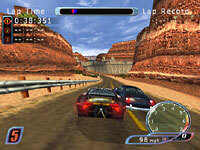 Speed Devils' story is that you earn money based on how well you do in the races. With this virtual cash you can buy more expensive cars or modify your current vehicle with better tires, a new paint job or an engine upgrade such as nitro boost. It's wise to also set aside some savings for repairs -- you're gonna need it. When you play on SegaNet, you can bet your money on the outcome of a race with your competitors (up to five people can race together on SegaNet), giving you that much more motivation to win.